Making sure your roof is ready for the winter is one of the most important and beneficial things you can do as a homeowner or business owner living in Colorado. By “winterizing” your roof, you’re taking a proactive approach to ensure the people who either work or reside under your roof are protected from any major snow or winter storms we’re bound to get in Denver. 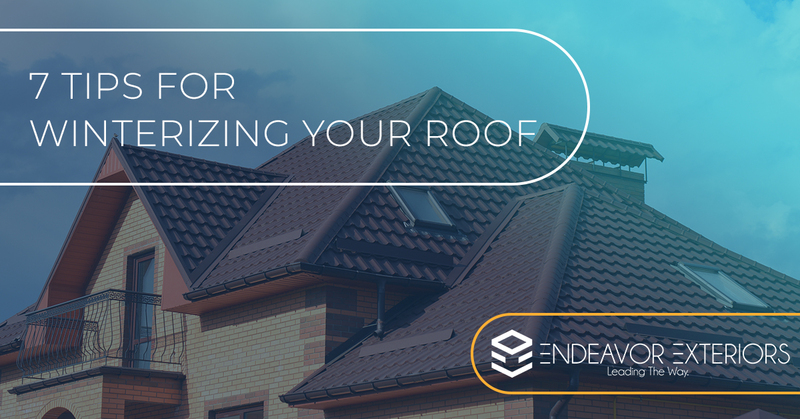 Not only will those who reap the benefits of your roof be well-protected, but by properly winterizing your roof, you can also rest assured that you’re taking the necessary precautions to keep damaging, expensive roof repairs out of your future. In today’s blog post, we’ll provide you with 7 tips and tricks that will help protect your roof from damages this winter season. In the case that you do need roof repairs in Denver and you’re looking for professional assistance from a reliable roofing company, contact our team at Endeavor Exteriors. We have more than 75 years of combined experience in the exterior restoration industry, and we’ll ensure our roofing crews tackle your project correctly and get it done when we say we will. Learn more about our residential roof repair here. Continue reading below for 7 tips on winterizing your roof! 1. Clean and repair your gutters as necessary. Your gutters play a big role in the overall well-being of your roof. They help collect water and direct it away from the foundation of your home, avoid any cases of mildew or mold growth or breakage from over-filling. Ensure your gutters are clear of any debris, and if there are any repairs that need to be done, get those done before another major snowstorm hits. 2. Remove any debris from your rooftop. Any trash or natural debris on your roof needs to be removed from your roof in order to keep your shingles in tip-top shape before they’re inevitably covered with snow. If you don’t feel comfortable getting on your roof by yourself, call for the help of a professional roofing team. 3. Take care of any mildew and/or mold. Have you noticed the growth of mildew or mold on the shingles of your rooftop? Chances are, if you can’t see it, you can probably smell it. Get this removed by a professional immediately to ensure it doesn’t cause you any major issues down the road. 4. Patch any broken or missing shingles. This one might seem like a no-brainer, but if your shingles are broken or missing, you’ll more than likely experience a leaky roof once a storm rolls around. On top of that, you’ll be more likely to blast your heat to make up for the lack of insulation, increasing your utility bills. Patch up any broken or missing shingles as soon as possible. 5. Practice safe and sensible pest control. Pests, such as squirrels, mice or rabbits, tend to find shelter indoors once it cools down outside. If they make their way into your home or office, you’ll have a bigger headache on your hands than you could even imagine. Make sure any entryways into your home are guarded off and implement sensible pest control practices. 6. Trim any tree branches hanging over your roof (or near it). When tree branches weigh heavier than normal due to the weight of moisture from rain or snow, they’re more likely to snap and collapse. In the wintertime, this is more of an apparent issue since weather conditions are less than optimal. Make sure to trim any tree branches hanging near your home before you unexpectedly come home to a tree branch in the middle of your living room. 7. Schedule a roof inspection by a professional roofing company. A professional roofing crew is trained and experienced enough to perform a thorough roof inspection. Roofers know what to look for and, chances are, they can properly assess any potential issues better than you can as a homeowner or business owner. If you want to ensure your roof is well-protected this winter, a professional can ensure this better than any ol’ average Joe. Even if you take the appropriate precautions to ensure your roof is ready and well-protected for winter, life can still throw some unexpected situations your way. When you find yourself in the need of roof repairs, don’t be afraid to reach out to our team of roofing contractors in Denver. If you’re looking for a reliable roofing company to tackle your next roof repair project in Denver, we’re sure our roofing crews at Endeavor Exteriors can tackle the job with efficiency and effectiveness. We offer some of the best roofing services in Denver and surrounding communities — residential, multi-family and commercial. Reach out to our established and experienced roofing team today. You can reach us by calling (720) 464-3472 or by filling out our online form.